Dutchman Weibe Wakker has completed a 3 year, 33 country, 59,000 mile (94951 kms) journey from Amsterdam to Sydney in an electric vehicle. 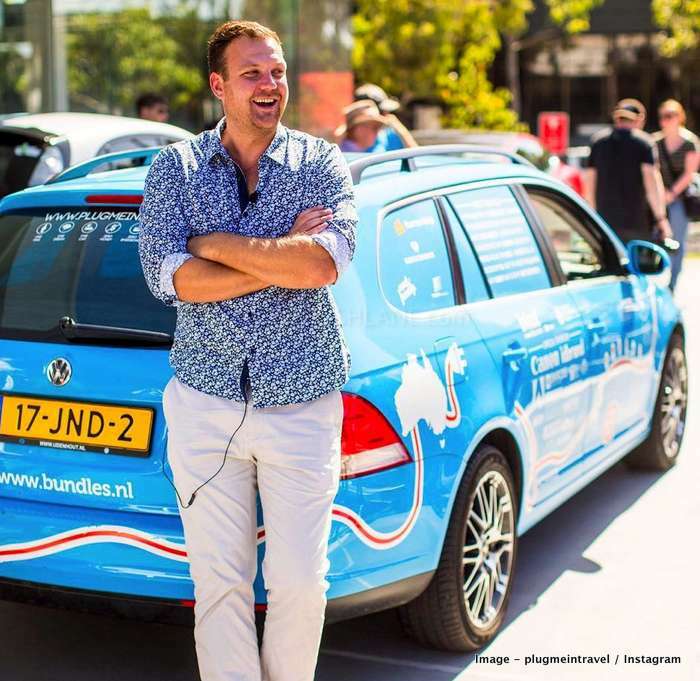 Dutchman Weibe Wakker has created history by undertaking the world’s longest electric car trip. 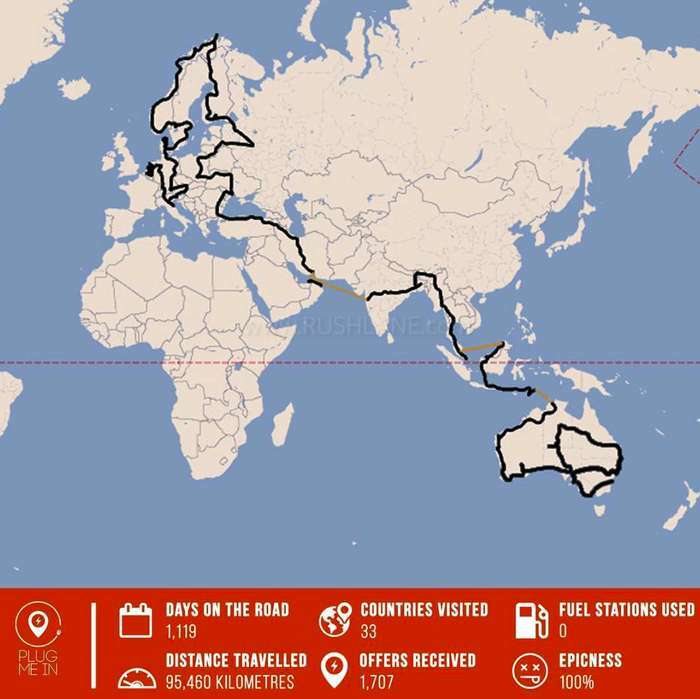 This journey has spanned 3 years, 33 countries and completed 59,000 mile (94,951 kms) journey from Amsterdam to Sydney. Wakker set out from Amsterdam in the Netherlands on 15th March 2016 and has just completed the journey on April 7, 2019. This was a part of the “Plug Me In” project and the journey was undertaken not in any better known Tesla EV, but in his electric powered VW Golf named The Blue Bandit. The trip was made possible through donations and sponsorships from companies such as Bundles – a washing machine rental company, Canon and Adobe. Sponsors also funded meals or a place to sleep or an outlet for Wakker to charge his vehicle via the Wakker site. The station wagon offered around 124 miles (around 200 kms) on a single charge. Weibe Wakker set out with no definite route. Instead his route was determined by local persons who would allow him to charge his vehicle. He traveled over Eastern Europe, through Turkey, Iran, and Middle East. He then crossed into India and on to Myanmar, Thailand, and Malaysia and finally reached his destination –Sydney, Australia. Wakker and a motorcade of electric cars crossed Sydney’s Harbour Bridge with the journey coming to a close at the Royal Botanical Gardens by Sydney Opera House. Without modifying his fuel powered VW Golf to an all electric one, Wakker would have used around 1792 US gallons of fuel for this trip. This would have cost $4,552 (INR 3,14,827) as per average fuel prices in 2018. Instead he has spent just $300 (INR 20,748) on electricity. Most of which was spent across the Australian Outback. All his efforts to promote EV adoption have stood him in good stead. Wakker has documented the entire journey in a series of videos uploaded onto social media which also includes chats with organizations and activist showing off the possibility of electric cars. The long drive across continents point to the possibility that electric vehicles could definitely be used for daily commute. EV owner, Ranjan Ray, too has who completed 1 lakh kms on his Mahindra e2o but this wasn’t a sojourn across borders. He uses his experience with the EV to educate and inform others about EV usage. His trip cost his 70k worth of electricity.